The catabolic pathways of N-acetyl-D-galactosamine (Aga) and D-galactosamine (Gam) in E. coli were proposed from bioinformatic analysis of the aga/gam regulon in E. coli K-12 and later from studies using E. coli C. Of the thirteen genes in this cluster, the roles of agaA, agaI, and agaS predicted to code for Aga-6-P-deacetylase, Gam-6-P deaminase/isomerase, and ketose-aldolase isomerase, respectively, have not been experimentally tested. Here we study their roles in Aga and Gam utilization in E. coli O157:H7 and in E. coli C.
Knockout mutants in agaA, agaI, and agaS were constructed to test their roles in Aga and Gam utilization. 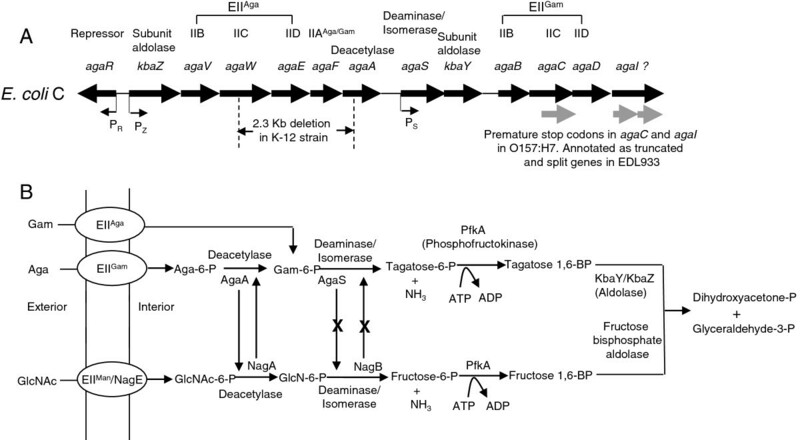 Knockout mutants in the N-acetylglucosamine (GlcNAc) pathway genes nagA and nagB coding for GlcNAc-6-P deacetylase and glucosamine-6-P deaminase/isomerase, respectively, and double knockout mutants ΔagaA ΔnagA and ∆agaI ∆nagB were also constructed to investigate if there is any interplay of these enzymes between the Aga/Gam and the GlcNAc pathways. It is shown that Aga utilization was unaffected in ΔagaA mutants but ΔagaA ΔnagA mutants were blocked in Aga and GlcNAc utilization. E. coli C ΔnagA could not grow on GlcNAc but could grow when the aga/gam regulon was constitutively expressed. Complementation of ΔagaA ΔnagA mutants with either agaA or nagA resulted in growth on both Aga and GlcNAc. It was also found that ΔagaI, ΔnagB, and ∆agaI ΔnagB mutants were unaffected in utilization of Aga and Gam. Importantly, ΔagaS mutants were blocked in Aga and Gam utilization. Expression analysis of relevant genes in these strains with different genetic backgrounds by real time RT-PCR supported these observations. Aga utilization was not affected in ΔagaA mutants because nagA was expressed and substituted for agaA. Complementation of ΔagaA ΔnagA mutants with either agaA or nagA also showed that both agaA and nagA can substitute for each other. The ∆agaI, ∆nagB, and ∆agaI ∆nagB mutants were not affected in Aga and Gam utilization indicating that neither agaI nor nagB is involved in the deamination and isomerization of Gam-6-P. We propose that agaS codes for Gam-6-P deaminase/isomerase in the Aga/Gam pathway. The pathway for utilization of the amino sugar, N-acetyl-D-galactosamine (Aga), in Escherichia coli was proposed from bioinformatic analysis of the genome sequence of E. coli K-12  and by drawing parallels to the catabolic pathway of the related amino sugar, N-acetyl-D-glucosamine (GlcNAc) [2–5]. A more complete understanding of the Aga pathway came upon studying it in E. coli C because it has the whole set of 13 genes for the utilization of both Aga and D-galactosamine (Gam) and is therefore Aga+ Gam+ (Figure 1) . The K-12 strain, on the other hand, is Aga- Gam- because it has a 2.3 Kb deletion leading to the loss and truncation of genes that are needed for Aga and Gam utilization . The aga/gam regulon and the Aga/Gam pathway in E. coli has been described before [1, 6] and is shown in Figure 1. The transport of Aga and Gam into the cell as Aga-6-P and Gam-6-P, respectively, is mediated by their respective Enzyme II (EII) complexes of the phosphoenolpyruvate: carbohydrate phosphotransferase system (PTS) [7, 8] and is further catabolized as shown in Figure 1B. The agaI gene was predicted to code for Gam-6-P deaminase/isomerase that converts Gam-6-P to tagatose-6-P and NH3[1, 6] but as shown here later this is not so. The proposed Aga/Gam pathway is analogous to the better studied GlcNAc pathway (Figure 1B) [2–5]. GlcNAc, a PTS sugar, is transported by the GlcNAc PTS coded by nagE or by the mannose PTS coded by manXYZ. The resulting GlcNAc-6-P is deacetylated by GlcNAc-6-P deacetylase coded by nagA to glucosamine-6-P (GlcN-6-P). GlcN-6-P is then deaminated and isomerized by nagB encoded GlcN-6-P deaminase/isomerase forming fructose-6-P and NH3. The aga/gam regulon and the Aga, Gam, and GlcNAc pathways in E. coli . (A) The genetic map (not drawn according to scale) shows the 13 genes and the protein products that they code for in the 12.3 Kb aga/gam cluster in E. coli C. The agaI gene was predicted to code for Gam-6-P deaminase/isomerase but this study and that of Leyn et al. shows that agaS code for this deaminase. The question mark next to agaI indicates that the function of this gene is now uncertain. PR., PZ, and PS are the promoters and the arrows indicate the direction of transcription. The 2.3 Kb deletion in the K-12 strain is shown and the truncated agaC gene and the split agaI gene as annotated in strain EDL933 are shown in gray arrows. (B) The Aga/Gam and the GlcNAc pathways are depicted in this figure. The only change from what was known before about the Aga/Gam pathway [1, 6] is that AgaS carries out the deamination step and not AgaI as was known before. The GlcNAc pathway is shown to indicate the interplay between AgaA and NagA but not between AgaS and NagB as shown from this study. The upward vertical arrow from NagA indicates that it can substitute for AgaA and the downward vertical arrow indicates that AgaA can substitute for NagA when it is over-expressed. The upward vertical arrow from NagB with an X in the middle and a similar downward arrow from AgaS indicate that AgaS and NagB do not substitute for each other. Although the functions of the genes in the aga/gam cluster were initially surmised from in silico studies, there are some experimental data now that support the predicted functions of ten of the thirteen genes. Genetic and transport studies in E. coli C and in E. coli K-12 support the prediction of the PTS genes in the aga/gam cluster [6, 9]. The induction of tagatose 1, 6-BP aldolase activity by Aga and Gam along with other complementation studies demonstrates that kbaY codes for the aldolase [6, 10] and kbaZ codes for the subunit that is needed for full activity and stability in vitro. It has been shown that the agaR encoded repressor binds to promoters upstream of agaR, kbaZ, and agaS (Figure 1) . That agaA codes for Aga-6-P deacetylase was indirectly implied because Aga utilization was unaffected in a nagA mutant . The assigned role of the agaI gene as Gam-6-P deaminase/isomerase had not been tested and what, if any, role the agaS gene plays in the Aga/Gam pathway was not known although it was predicted to code for a ketose-aldose isomerase [1, 6, 11]. The interest in the Aga/Gam pathway stems from our earlier finding that isolates of the foodborne pathogen, E. coli O157:H7, from a spinach outbreak could not utilize Aga because of a point mutation in EIIAAga/Gam (Gly91Ser) . We also pointed out that E. coli O157:H7, strains EDL933 and Sakai, harbor two additional point mutations in agaC and agaI. Both mutations change a CAG codon coding for glutamine to TAG, an amber stop codon: one in the eighth codon of the agaC gene that codes for EIICGam; and the other in the 72nd codon of the agaI gene that had been proposed to code for Gam-6-P deaminase/isomerase. Although these two mutations reside in both EDL933 and Sakai strains, the annotations are different in these two strains. In EDL933, agaC is annotated as a 5’ truncated gene and agaI is annotated as a split gene (Figure 1) whereas, in the Sakai strain they are not annotated at all . In E. coli O157:H7, the amber mutation in agaC affects EIICGam which explains the Gam- phenotype but the mutation in agaI does not affect utilization of Aga as the sole source for carbon and nitrogen . The obvious question that arises is how does this happen without an active Gam-6-P deaminase/isomerase. E. coli K-12 is Aga- Gam- but isolation of suppressor mutants of E. coli K-12 with mutations in the GlcNAc regulon that were Aga+ Gam- has been reported . These mutants transported Aga by the GlcNAc PTS and since nagA was required for Aga utilization it was inferred that NagA deacetylated Aga-6-P. Based on these findings we had hypothesized, by analogy, that nagB might similarly substitute for agaI in E. coli O157:H7 enabling it to utilize Aga as carbon and nitrogen source  and here we test this hypothesis. In this study a genetic approach was taken to delineate the roles of agaA, agaI, and agaS in the Aga/Gam pathway in E. coli. These studies were carried out in parallel using E. coli O157:H7 strain EDL933 and in E. coli C. E. coli C was chosen because, unlike E. coli O157:H7, it does not have the mutations in agaC and agaI and also because it is Gam+, one can study the roles of agaI and agaS in Gam utilization. We show using knockout mutants and by complementation studies that agaA is not essential for Aga utilization and that AgaA and NagA can function as deacetylases in both the Aga and the GlcNAc pathways. The phenotype of deleting agaR in a nagA strain was also studied but only in E. coli C. Expression analysis of the relevant genes of these two pathways by quantitative real time RT-PCR (qRT-PCR) validated our conclusions. We also show that in the absence of agaI, nagB or both agaI and nagB, utilization of Aga and Gam is not affected which contradicts our initial hypothesis that nagB might substitute for the absence of agaI in E. coli O157:H7 . Finally, we show that utilization of both Aga and Gam is blocked in agaS knockout mutants and we propose that this gene codes for Gam-6-P deaminase/isomerase. [Part of this work was presented by the authors as a poster in the 112th General Meeting of ASM, San Francisco, June 16th-19th, 2012: A Genetic Approach to Study Utilization of N-Acetyl-D-Galactosamine and D-Galactosamine in Escherichia coli Strains O157:H7 and C (Abstract K-1351)]. The role of the agaA gene in Aga utilization was tested by constructing agaA deletion mutants in EDL933 and in E. coli C and analyzing them for growth on Aga and GlcNAc minimal medium plates. Unexpectedly, the utilization of Aga was unaffected in both ΔagaA mutant strains (Figure 2A). However, the ΔagaA mutants were unaffected in GlcNAc utilization (Figure 2B) and this was not unexpected because the nagA gene is intact. As mentioned above, earlier genetic studies implied that Aga can be utilized by the GlcNAc pathway provided nagA is present . Assuming that an unknown deacetylase is not involved in Aga-6-P deacetylation, the most likely explanation how ΔagaA mutants grew on Aga would be that Aga-6-P is deacetylated by NagA. Therefore, the presence of either agaA or nagA should be sufficient for growth on Aga. To test this unequivocally, ΔnagA mutants and double knockout mutants, ΔagaA ΔnagA, of EDL933 and E. coli C were constructed and examined for Aga and GlcNAc utilization. EDL933 ΔnagA and E. coli C ΔnagA grew on Aga but did not grow on GlcNAc (Figures 2A and 2B). These results essentially confirmed earlier reports that nagA mutants of E. coli K-12 cannot grow on GlcNAc but can grow on Aga [2, 4, 6]. Phenotypic microarray experiments using the Biolog system  also showed that the ΔnagA mutants could not utilize N-acetylmannosamine (ManNAc) and N-acetylneuraminic acid (data not shown) because all three utilization pathways converge to the common intermediate GlcNAc-6-P . When the ΔagaA ΔnagA double knockout mutant strains of EDL933 and E. coli C were examined for growth on GlcNAc and Aga it was found that both strains did not grow on GlcNAc as expected but importantly, these mutants also did not grow on Aga (Figures 2A and 2B). These results indicate that agaA is not essential for Aga utilization because nagA can substitute for agaA and therefore the presence of either agaA or nagA is sufficient for Aga utilization. Growth of EDL933, E. coli C, and their mutants on Aga and GlcNAc. EDL933, E. coli C, and the indicated knockout mutants derived from them were streaked out on MOPS minimal agar plates containing Aga (A) and GlcNAc (B) and incubated at 37°C for 48 h. The description of the strains in the eight sectors of the plates is indicated in the diagram below (C). To investigate if NagA is induced in ΔagaA mutants when grown on Aga we examined the relative expression levels of agaA and nagA in wild type, ΔagaA, and ΔnagA strains of EDL933 and E. coli C grown on different carbon sources by qRT-PCR. The expression of the agaS gene was also examined as a second gene of the aga/gam regulon that is under the control of the second promoter, Ps, and similarly nagB was chosen as a second gene of the nag regulon. Relative expression levels of genes in wild type and mutant strains of EDL933 and E. coli C grown on Aga and GlcNAc were calculated with respect to that of the expression of the corresponding genes in wild type strains grown on glycerol. As shown in Table 1, growth on Aga induced agaA and agaS about 375 and 500-fold, respectively, in EDL933 and about 30 and 60-fold, respectively, in E. coli C. The nagA and nagB genes were not induced by Aga in either strain. Growth on GlcNAc induced nagA and nagB about 12 and 24-fold, respectively, in EDL933 and 16 and 23 fold, respectively, in E. coli C. In presence of GlcNAc, agaA and agaS were not induced in EDL933, but in E. coli C the induction was minimal, which is less than 10% of that in Aga grown cells. In Aga grown cells the induction of agaA and agaS was about 12 and 8-fold higher, respectively, in EDL933 than in E. coli C but the levels of induction of nagA and nagB in both strains grown on GlcNAc were comparable (Table 1). Earlier studies using single copy lysogenic derivatives of E. coli K-12 harboring Pz-lacZ and Ps-lacZ transcriptional fusions showed that the Pz and the Ps promoters were induced 5 and 20-fold, respectively, upon growth on Aga in minimal medium containing 0.2% casamino acids but growth in GlcNAc did not induce expression from these promoters . These levels of induction from the Pz and Ps promoters are much lower than what is reported here (Table 1) and that is most likely because of different experimental conditions, strains used, and assay method employed but the essential pattern of induction is the same in both studies in that Aga induces the aga/gam regulon and GlcNAc does not. Growth of E. coli K-12 on GlcNAc results in the induction of the nag regulon that includes nagBACD in one operon and the divergently transcribed operon with the nagE gene coding for the GlcNAc transport protein, EIINag. However, it has also been reported that in E. coli K92 the GlcNAc transport protein is induced by both GlcNAc and Aga . Although, in our qRT-PCR assays we only examined nagA and nagB expression and not nagE expression, the expression pattern of nagA and nagB should reflect that of nagE expression because they are all part of the nag regulon . Therefore, unlike what was observed in E. coli K92 , our data (Table 1) show that in EDL933 and E. coli C nagA and nagB were induced only by GlcNAc and not by Aga and thereby it would be reasonable to conclude that nagE was also not induced by growth on Aga. This discrepancy between our observation with two strains of E. coli, EDL933 and C, and that observed in E. coli strain K92  is probably due to strain difference. a Carbon source used for growth. b The relative expression values after the forward slash is that of E. coli C.
c ND indicates not detected. In ∆agaA mutants of EDL933 and E. coli C, the expression of agaA could not be detected, as expected, irrespective of the carbon source used for growth (Table 1). When these two ∆agaA mutants were grown on glycerol, the expression levels of agaS, nagA, and nagB were unchanged compared to that of the wild type strains grown on glycerol. When the ∆agaA mutants of EDL933 and E. coli C were grown on Aga, the induction of agaS was about 700-fold and 90-fold, respectively, which is140% higher than that in their parent strains grown on Aga (Table 1). Thus, the relative expression level of agaS was higher in ∆agaA mutants grown on Aga. In Aga grown ∆agaA mutants, nagA and nagB were significantly induced whereas, these genes were not induced at all in wild type strains grown on Aga. In fact, in Aga grown EDL933 ∆agaA, the relative expression levels of nagA and nagB were about 130% compared to that of their expressions in wild type EDL933 and EDL933 ∆agaA grown on GlcNAc. The relative expression levels of nagA and nagB in E. coli C ∆agaA grown on Aga were about 70% of that when grown on GlcNAc and 40% of that in E. coli C grown on GlcNAc. In GlcNAc grown EDL933 ∆agaA, the expression levels of nagA and nagB were about the same as that of EDL933 grown on GlcNAc and the expression of agaS is slightly elevated but it is only about 1% of that in Aga grown EDL933. In E. coli C ∆agaA grown on GlcNAc the expression levels of nagA and nagB were 40% of that in E. coli C and the expression of agaS is about 3-fold higher than that grown in glycerol but it is about 5% of the level expressed in Aga grown E. coli C and E. coli C ∆agaA. What is noteworthy is that unlike in Aga grown wild type EDL933 and E. coli C where nagA and nagB were not induced, their respective ∆agaA mutants when grown on Aga induced nagA and nagB to levels that were comparable to the induced levels in GlcNAc grown in the wild type and the ∆agaA mutants of these strains. Importantly, this data shows that NagA is indeed present in Aga grown ΔagaA mutants and therefore it lends additional support to the genetic data (Figure 2) from which we concluded that ∆agaA mutants of EDL933 and E. coli C were able to grow on Aga (Figure 2) because NagA can substitute for the absence of AgaA. This observation leads to the question how do ΔagaA mutants grown on Aga induce nagA and nagB and thereby the nag regulon. A probable explanation is that when ΔagaA mutants grow on Aga they accumulate Aga-6-P which induces the nag regulon and upon synthesis of NagA it deacetylates Aga-6-P. It has been shown that the inducer of the nag regulon is GlcNAc-6-P and not GlcN, GlcNAc, GlcN-6-P, and G-1-P . There is also indirect evidence that Aga-6-P is the inducer of the aga/gam regulon  but whether Aga-6-P can also induce the nag regulon has not been demonstrated. When nagA and nagB expression levels were examined in glycerol grown ΔnagA mutants it was found that expression of nagA was not detected as expected, and agaA and agaS were expressed at very low levels. However, nagB was induced 61-fold in EDL933 ΔnagA and 19-fold in E. coli C ΔnagA whereas, in their respective wild type parents grown on glycerol it was not induced (Table 1). These expression levels of nagB in glycerol grown EDL933 ΔnagA and E. coli C ∆agaA were about 250% and 80%, respectively, of their respective wild type strains grown in GlcNAc. This is significantly high considering that the expression of nagB remains at the uninduced levels in the wild type strains grown on glycerol. This phenomenon of nagB induction in nagA mutants of E. coli K-12 grown on glucose has been reported earlier [2, 4]. It has been explained that this happens because of the endogenous synthesis of GlcNAc-6-P, the inducer of the nag regulon, that accumulates in nagA mutants which in turn induces the nag regulon [2, 4]. It was also reported that this accumulated substance in ΔnagA mutants disappeared upon incubation of a cell extract with overexpressed GlcNAc-6-P deacetylase . The ΔnagA mutants in this study were grown in glycerol and not in glucose as in the earlier reports [2, 4] but that did not affect the endogenous synthesis of GlcNAc-6-P, as we still observed nagB induction in these mutants. What is interesting to note, however, is that when both the ΔnagA mutants were grown on Aga, the induced levels of nagB fell drastically to about 10% of that in glycerol grown ΔnagA mutants (Table 1). A very likely reason why this happens is that upon induction of agaA in ΔnagA mutants by Aga, the induced AgaA deacetylates the accumulated GlcNAc-6-P to GlcN-6-P thereby lowering the intracellular concentration of GlcNAc-6-P which results in turning down the expression of the nag regulon. This strongly suggests that AgaA can deacetylate GlcNAc-6-P in addition to Aga-6-P just like NagA can substitute for the absence of AgaA. Finally, in Aga grown EDL933 ΔnagA the induced levels of agaA and agaS were about 220% and 180%, respectively, of that in Aga grown EDL933 and likewise, in E. coli C ΔnagA grown on Aga, the induced levels of agaA and agaS were about 550% and 150%, respectively, of that in E. coli C grown on Aga. Why this happens remains to be investigated. The induction of nagB in ΔnagA mutants grown on glycerol and its repression when grown on Aga (Table 1) indicated that AgaA deacetylated GlcNAc-6-P. Unlike ΔagaA mutants which grew on Aga (Figure 2) because nagA was expressed in these mutants by Aga (Table 1), ΔnagA mutants did not grow on GlcNAc most likely because agaA is not expressed with GlcNAc (Figure 1). If this is true, then deleting the agaR gene, that codes for the repressor of the aga/gam regulon, in a ΔnagA mutant would result in the constitutive expression of the aga/gam regulon and thereby of agaA that would allow its growth on GlcNAc. Therefore, agaR deletion mutants in E. coli C and in E. coli C ΔnagA were constructed and examined for growth on GlcNAc. 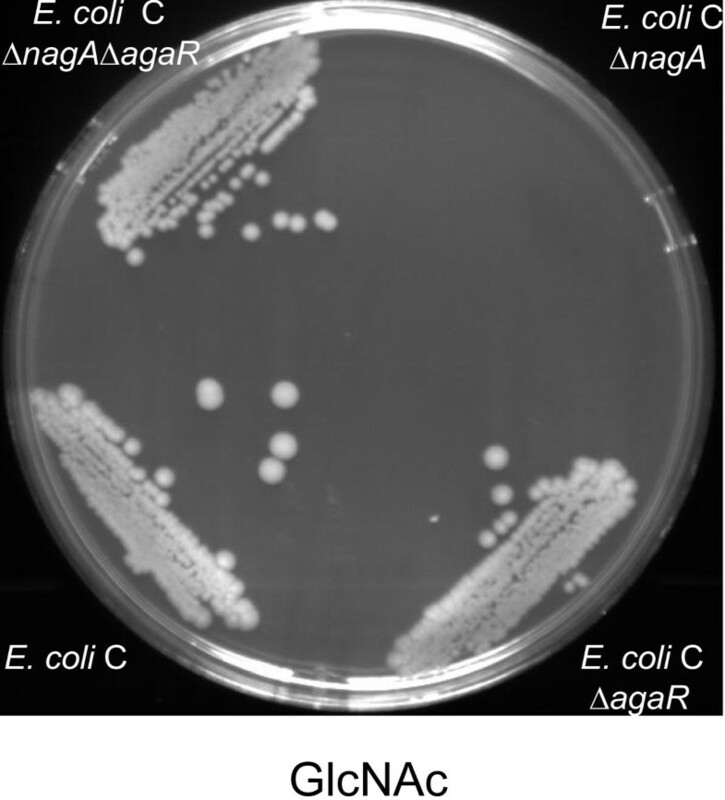 As shown in Figure 3, E. coli C and E. coli C ΔagaR grew on GlcNAc and the ΔnagA mutant did not grow but the double knockout strain, E. coli C ΔnagA ΔagaR, did indeed grow on GlcNAc. Phenotypic microarray  done with E. coli C ΔnagA ΔagaR also revealed that it regained the ability to utilize ManNAc and N-acetylneuraminic acid in addition to that of GlcNAc (data not shown) as their utilization is nagA dependent . Analysis by qRT-PCR was done to confirm that agaA and agaS were constitutively expressed in E. coli C ΔagaR and in E. coli C ΔnagA ΔagaR. As shown in Table 2, agaA and agaS were expressed in E. coli C ΔagaR and E. coli C ΔnagA ΔagaR irrespective of the carbon source used for growth but nagA and nagB were induced only by GlcNAc and, as expected, nagA expression was not detected in E. coli C ΔnagA ΔagaR. In fact, agaA and agaS were induced higher in these ΔagaR mutants than that in Aga grown E. coli C, the only exception being that of agaA whose induction was slightly lower in GlcNAc grown E. coli ΔagaR. 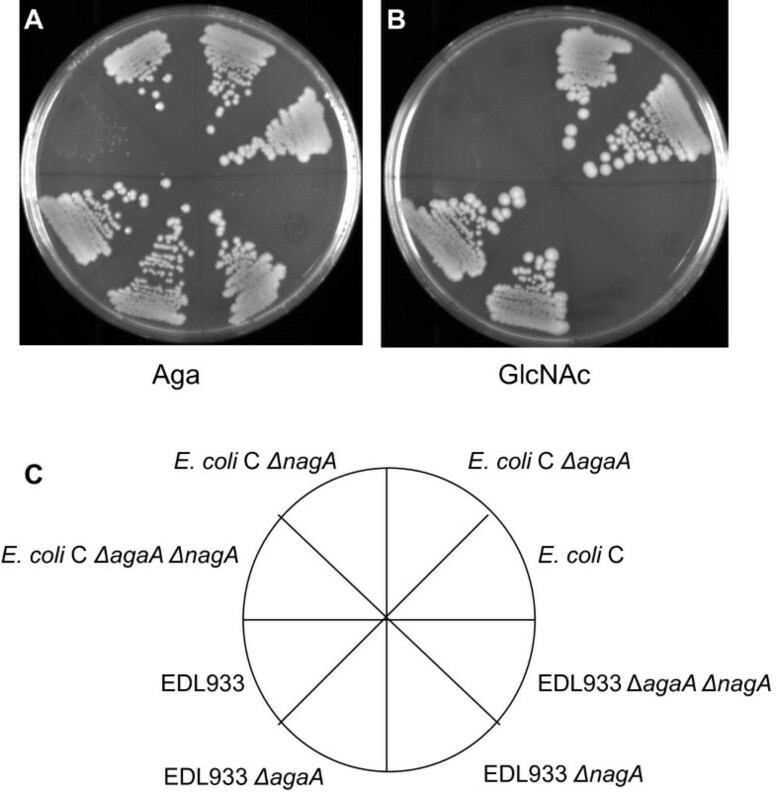 These results confirm that agaA and agaS and thereby the aga/gam regulon were constitutively expressed in E. coli C ΔagaR and in E. coli C ΔnagA ΔagaR. This demonstrates that constitutive synthesis of AgaA can substitute for NagA in a ΔnagA mutant and allow it to grow on GlcNAc (Figure 3) just as NagA can substitute for AgaA in a ΔagaA mutant (Figure 2 and Table 1). It is interesting to note that unlike in glycerol grown E. coli C ΔnagA where nagB was induced 19-fold (Table 1), in glycerol grown E. coli C ΔnagA ΔagaR, where agaA was constitutively expressed, the relative expression of nagB was down to 2-fold (Table 2) which is the same as that in Aga grown E. coli C ΔnagA (Table 1). 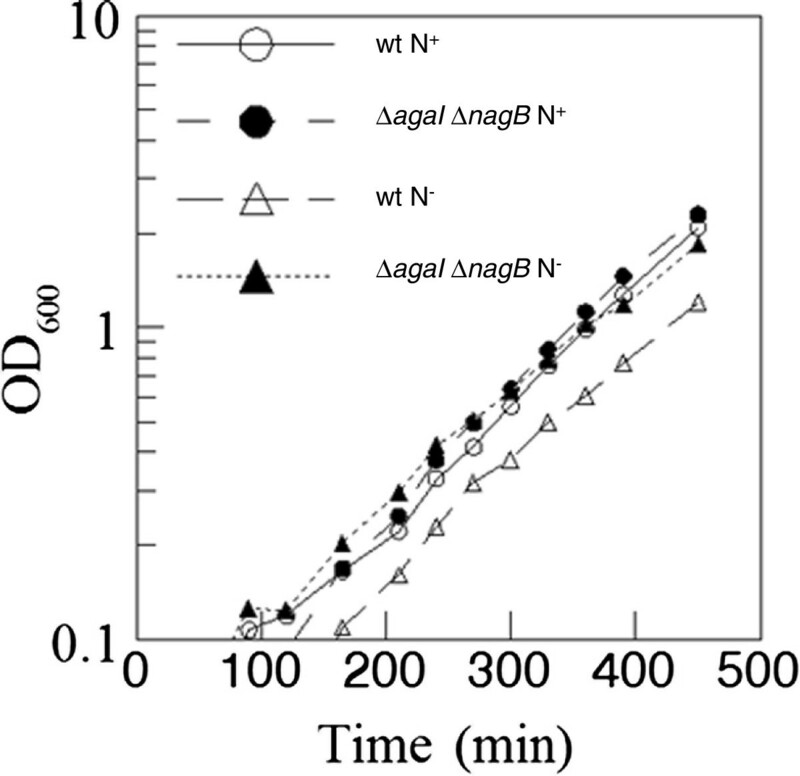 Thus, either the induced expression of agaA in E. coli C ΔnagA by growth on Aga (Table 1) or the constitutive expression of agaA in glycerol grown E. coli C ΔnagA ΔagaR (Table 2), turns down nagB induction significantly. Both these experiments indicate that AgaA can deacetylate GlcNAc-6-P.
Growth of E. coli C and mutants derived from it on GlcNAc. E. coli C and the indicated mutants derived from it were streaked out on GlcNAc MOPS minimal agar plates and incubated at 37°C for 48 h.
b ND indicates not detected. The genetic and the qRT-PCR data described above show that agaA and nagA can substitute for each other. The relative expression levels in Table 1 show that in Aga grown ΔagaA mutants, nagA and nagB and thereby the nag regulon were induced and in E. coli C ΔnagA ΔagaR, agaA and agaS and thereby the whole aga/gam regulon were constitutively expressed. Although both regulons were turned on it is apparent that the expression of nagA in ΔagaA mutants and the expression of agaA in E. coli C nagA ΔagaR allowed growth on Aga and GlcNAc, respectively, and not the other genes of their respective regulons. In order to demonstrate that this is indeed so and to provide additional evidence that agaA and nagA can substitute for each other, we examined if both agaA and nagA would complement ΔnagA mutants to grow on GlcNAc and ΔagaA ΔnagA mutants to grow on Aga and GlcNAc. EDL933/pJF118HE and EDL933 ΔagaA/pJF118HE grew on Aga and GlcNAc, EDL933 ΔnagA/pJF118HE grew on Aga but not on GlcNAc, and EDL933 ΔagaA ΔnagA/pJF118HE did not grow on Aga and GlcNAc (Figures 4A and 4B). These results are the same as what was observed with these strains without pJF118HE (Figure 2). EDL933 ΔnagA/ pJFnagAED grew on GlcNAc which was expected but interestingly EDL933 ΔnagA/ pJFagaAED also grew on GlcNAc showing that agaA restored growth of a ΔnagA mutant on GlcNAc (Figure 4B). When EDL933 ΔagaA ΔnagA was complemented with either pJFnagAED or pJFagaAED growth was restored on both GlcNAc and xAga plates (Figures 4A and 4B). The plates shown in Figure 4 were incubated without IPTG indicating that the basal level of expression of NagA and AgaA from pJFnagAED and pJFagaAED, repectively, were sufficient for complementation for growth on GlcNAc and Aga. Growth on GlcNAc and Aga plates at IPTG concentrations of 10, 50 and 100 μM was similar to that without IPTG indicating that higher levels of expression of agaA and nagA were not detrimental to the cells (data not shown). Identical results as those shown in Figure 4 were obtained in complementation experiments with E. coli C ΔagaA, ΔnagA, and ΔagaA ΔnagA mutants with plasmids, pJFagaAC and pJFnagAC (data not shown). Complementation of Δ nagA and Δ agaA Δ nagA mutants of EDL933 on Aga and GlcNAc plates. Wild type EDL933 and knockout mutants derived from it harboring the indicated plasmids were streaked out on MOPS minimal agar plates with ampicillin containing Aga (A) and GlcNAc (B) and incubated at 37°C for 48 h. The description of the strains with various plasmids in the eight sectors of the plates is indicated in the diagram below (C). Thus far, several lines of evidence using knockout mutants, complementation studies with these mutants, and measuring the relative expression of relevant genes in these mutant strains and in the wild type strains indicate that NagA coded by nagA and AgaA coded by agaA can function in both the GlcNAc and Aga pathways. In this context it is pointed out that it was reported in E. coli K92, growth on Aga not only induced the Aga transport system but also induced the GlcNAc transport system . From this observation it was proposed that an unidentified epimerase converts Aga-6-P to GlcNAc-6-P which then induces the GlcNAc transport system that is part of the nag regulon . Our data differ in that, nagA and nagB and therefore the nag regulon were induced only in ΔagaA mutants and not in wild type E. coli C and EDL933 (Table 1). Furthermore, epimerases usually carry out substrate concentration dependent reversible reactions. Therefore, the high intracellular concentration of GlcNAc-6-P that accumulate in glucose grown nagA mutant (3.2 mM) , which should be about the same in our glycerol grown ΔnagA mutants (discussed above), should have epimerized to Aga-6-P. Aga-6-P which is the likely inducer of the aga/gam regulon  would then induce the aga/gam regulon but we show that it was not induced (Table 1). Instead, nagB was highly induced and agaA and agaS were induced only 2-fold in EDL933 ΔnagA but not in E. coli C ΔnagA (Table 1). Given the evidence that we have so far and that such an epimerase is yet to be identified, it seems unlikely that such an epimerase links the two pathways. The nagA encoded GlcNAc-6-P deacetylase from E. coli K-12 has been purified and its enzymatic activity and properties are well established . Therefore, the fact that agaA can substitute nagA in the utilization of GlcNAc shown by complementation studies (Figure 4) is strong evidence that agaA codes for a deacetylase. These observations indicate that both NagA and AgaA can act on substrates that are structurally closely related to their actual substrates. In a study by Plumbridge and Vimr  on the catabolic pathways of GlcNAc, ManNAc, and N-acetylneuraminic acid, where all of these amino sugars converge to GlcNAc-6-P and hence their utilization was nagA dependent it was argued that ManNAc-6-P is not deacetylated by NagA but instead isomerized to GlcNAc-6-P by the product of another gene, yhcJ . Their reasoning was that while both GlcNAc-6-P and ManNAc-6-P are N-acetyl substituted sugars at the C2 position, ManNAc-6-P is an epimer of GlcNAc-6-P at the C2 position and therefore makes it unlikely that NagA could position itself on the sugar molecule such that it has access to the acetyl group on both sides of the C2 atom. However, this argument would not hold true for Aga-6-P because it is an epimer of GlcNAc-6-P at the C4 position and so in both molecules the N-acetyl group is on the same side of the C2 position and therefore both NagA and AgaA could deacetylate Aga-6-P and GlcNAc-6-P as supported by the genetic complementation experiments (Figure 4). While E. coli C and K-12 have an intact agaI, the agaI gene in E. coli O157:H7 has an amber mutation and yet it can utilize Aga. Four possible explanations can be proposed as to how E. coli O157:H7 can grow on Aga: i) nagB may substitute for the absence of agaI; ii) the split ORFs in agaI are translated to form two polypeptide chains that form a functional enzyme; iii) the suppression of the amber codon by a suppressor tRNA leading to translation of a functional enzyme ; and iv) agaI and nagB are not essential for Aga and Gam utilization and the product of some other gene carries out this step in the pathway. 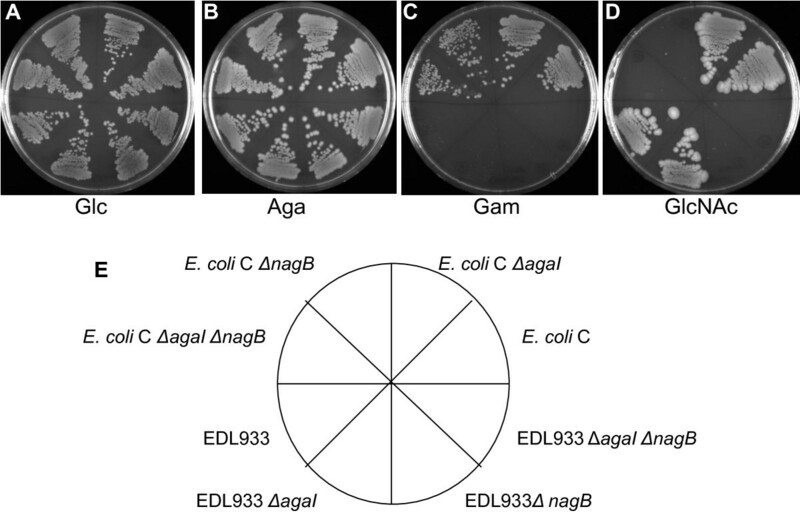 These proposals were tested by constructing ΔagaI, ΔnagB, and ΔagaI ΔnagB mutants of EDL933 and E. coli C and examining their growth on Aga, Gam, and GlcNAc with and without NH4Cl. Growth of these mutants on plates with just the amino sugar without any added nitrogen source such as NH4Cl, would indicate that deamination of the Aga and Gam is taking place in the cell and hence there must be a functional deaminase/isomerase. The wild type strains, EDL933 and E. coli C, and their ΔagaI, ΔnagB, and ΔagaI ΔnagB mutants were tested for growth on minimal medium plates containing glucose (Glc) as a control, Aga, Gam, and GlcNAc with and without NH4Cl as added nitrogen source. EDL933 and E. coli C and all the three mutants grew on Glc with NH4Cl (Figure 5A) but as expected none of them grew on Glc without a nitrogen source (data not shown). EDL933 and E. coli C grew on Aga and GlcNAc (Figures 5B and 5D) and E. coli C grew on Gam (Figure 5C) but EDL933 did not grow on Gam (Figure 5C) because it is Aga+ Gam- as explained earlier. Growth of EDL933 ΔagaI on Aga was not affected (Figure 5B). 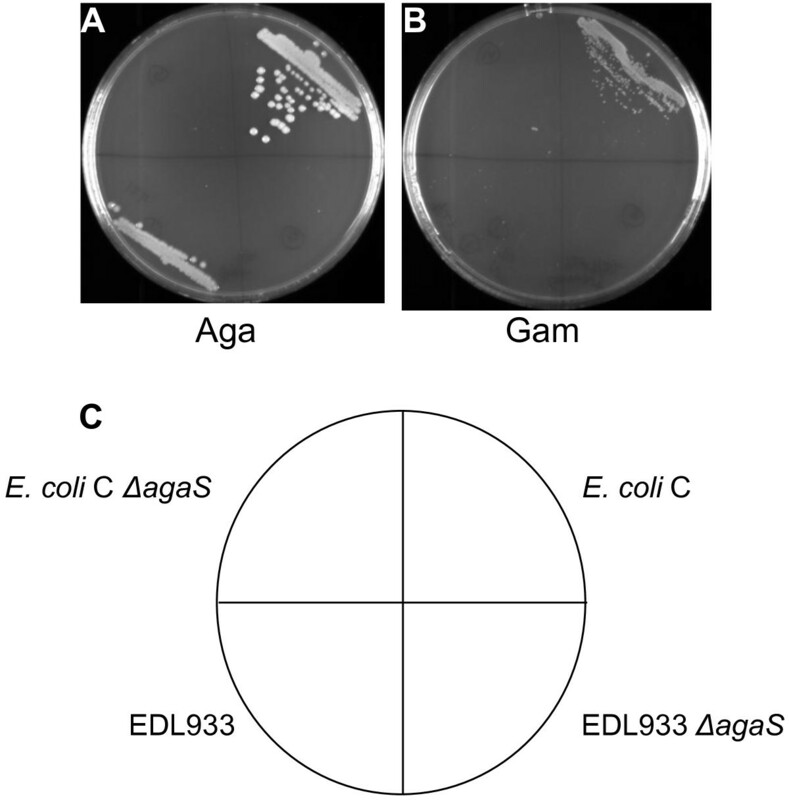 E. coli C ΔagaI also grew on Aga and Gam (Figures 5B and 5C) indicating that deletion of the intact agaI gene in E. coli C did not affect the utilization of these amino sugars just as Aga utilization was not affected in EDL933 ΔagaI. Growth on GlcNAc as carbon and nitrogen source was unaffected in ΔagaI mutants of EDL933 and E. coli C (Figure 5D) indicating that agaI is not involved in the utilization of GlcNAc. The utilization of Aga by EDL933 ΔnagB and that of Aga and Gam by E. coli C ΔnagB was unaffected (Figures 5B and 5C). To resolve, whether agaI and nagB substitute for each other as agaA and nagA do, ΔagaI ΔnagB mutants were examined for growth on Aga and Gam. As shown in Figure 5B, the utilization of Aga by EDL933 ΔagaI ΔnagB and that of Aga and Gam by E. coli C ΔagaI ΔnagB (Figures 5B and 5C) was not affected in these double knockout mutants thus providing convincing evidence that neither agaI nor nagB is required in the Aga/Gam pathway and particularly in the deamination and isomerization of Gam-6-P to tagatose-6-P and NH3. That ΔnagB and the ΔagaI ΔnagB mutants of EDL933 and E. coli C could not utilize GlcNAc (Figure 5D) was not unexpected as it is known that the loss of nagB affects GlcNAc utilization [2, 4]. Identical results were obtained as in Figures 5B, 5C, and 5D, when these mutants were analyzed for growth on Aga, Gam, and GlcNAc plates without any added nitrogen source (data not shown). Complementation of ΔnagB and the ΔagaI ΔnagB mutants of E. coli C with pJFnagB restored growth of these mutants on GlcNAc containing NH4Cl thus showing that the inability of these mutants to grow on GlcNAc was solely due to the loss of nagB (data not shown). In addition, we have also observed by phenotypic microarray [12, 13] that utilization of GlcN, ManNAc, and N-acetylneuraminic acid was also affected in ΔnagB and ΔagaI ΔnagB mutants (data not shown) as catabolism of these amino sugars is known to lead to the formation of GlcN-6-P as a common intermediate . Relative expression levels of agaA, agaS, and nagA were examined by qRT-PCR in these ΔnagB mutants following growth on glycerol and Aga. In glycerol grown ΔnagB mutants of EDL933 and E. coli C, agaA, agaS, and nagA were not induced. This is unlike ΔnagA mutants grown on glycerol where nagB was induced (Table 1). When grown on Aga, agaA and agaS were induced about 685-fold and 870-fold, respectively, in EDL933 ΔnagB and 150-fold and 90-fold, respectively, in E. coli C ΔnagB. These levels of induction are comparable to that in Aga grown ΔnagA mutants (Table 1). The nagA gene was not induced in Aga grown ΔnagB mutants. It was also examined if agaI on a multi-copy plasmid would complement ΔnagB and ΔagaI ΔnagB mutants for growth on GlcNAc. The plasmid, pJFagaI, did not complement these mutants of E. coli C for growth on GlcNAc even in the presence of 10, 50, and 100 μM IPTG (data not shown) indicating that agaI cannot substitute for the absence of nagB. Growth of EDL933, E. coli C, and mutants derived from them on different carbon sources. EDL933, E. coli C, and the indicated knockout mutants derived from them were streaked out on MOPS minimal agar plates with glucose (A), Aga (B), Gam (C), and GlcNAc (D) with NH4Cl as added nitrogen source. All plates, except Gam containing plates, were incubated at 37°C for 48 h. Gam plates were incubated at 30°C for 72 to 96 h. The description of the strains in the eight sectors of the plates is indicated in the diagram below (E). Growth rates of these mutants were measured in liquid MOPS minimal medium containing Aga with or without added NH4Cl in order to find if they would manifest growth rate differences compared to the wild type that otherwise cannot be detected by growth on plates. The doubling times of EDL933 and E. coli C in Aga MOPS medium with NH4Cl were about 80 and 115 min, respectively, and their doubling times without NH4Cl were about 90 and 135 min, respectively (data not shown for E. coli C) (Figure 6). The doubling times of the ΔagaI, ΔnagB, and ΔagaI ΔnagB mutants of EDL933 and E. coli C in Aga MOPS medium with and without NH4Cl were similar to that of their wild type parent strains (data not shown except for EDL933 and EDL933 ΔagaI ΔnagB in Figure 6). As seen from the slope of the plots there is no discernible difference in the doubling times of EDL933 ΔagaI ΔnagB on Aga with and without NH4Cl when compared with the doubling times of EDL933 in similar medium. The readings plotted in Figure 6 were from the exponential phase of growth of the cells and the growth curve for EDL933 without NH4Cl (N-) is slightly shifted to the right because of a longer lag phase but the slope is similar to that of EDL933 ΔagaI ΔnagB without NH4Cl. These growth experiments in liquid medium confirm the experiments done on plates (Figure 5). Growth of EDL933 and EDL933 Δ agaI Δ nagB in Aga liquid medium with and without NH 4 Cl. EDL933 (wt) and EDL933 ΔagaI ΔnagB were grown with shaking at 37°C in Aga MOPS medium with NH4Cl (N+) and without NH4Cl (N-). Growth (OD600) was monitored at indicated time intervals. The catalytic mechanism and the crystal structure of GlcN6-P deaminase/isomerase have been studied in detail [16–18] but to our knowledge there is only one report that showed that this enzyme was specific for only GlcN-6-P and Gam-6-P was unaffected . Our studies with the ∆nagB mutant of EDL933 and particularly with ∆agaI ∆nagB mutants of EDL933 and E. coli C corroborate the lack of specificity of GlcNAc-6-P deaminase/isomerase for Gam-6-P. This is because had nagB been involved in the deamination and isomerization of Gam-6-P in strains where agaI is missing, then growth on Aga of EDL933 ∆nagB and EDL933 ∆agaI ∆nagB and growth on Aga and Gam of E. coli C ∆agaI ∆nagB would have been affected (Figure 5). In addition, as shown above, agaI cannot substitute for the absence of nagB, because pJFagaI could not complement ΔnagB and ΔagaI ΔnagB mutants of E. coli C. Together, these results show that agaI and nagB are not involved in Aga and Gam utilization. These results show that first three of the four proposals that we proposed above, do not hold true. Therefore, our fourth proposal that agaI and nagB are not essential for Aga and Gam utilization and that some other gene carries out the deamination/isomerization step holds true. So it poses the question which gene is involved in this step of the Aga/Gam pathway. The agaS gene in the aga/gam cluster has not been assigned to any of the steps in the catabolism of Aga and Gam (Figure 1) [1, 6]. Since agaS has homology to sugar isomerases  it was tested if deleting agaS would affect Aga and Gam utilization. 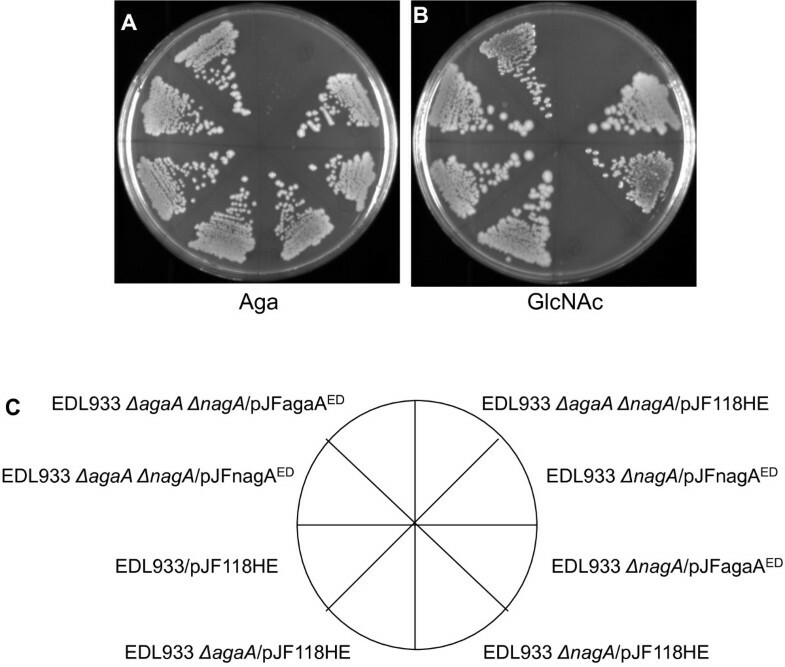 EDL933 ΔagaS and E. coli C ΔagaS, did not grow on Aga plates but their parent strains grew (Figure 7A). 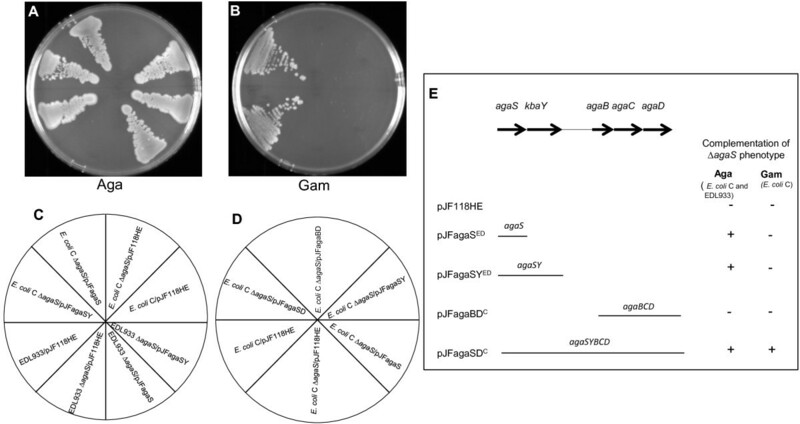 On Gam plates, wild type E. coli C grew but E. coli C ΔagaS did not grow (Figure 7B). EDL933 and EDL933 ΔagaS were streaked on Gam plates but they were not expected to grow because EDL933 is Gam- (Figure 7B). The results were identical when the ΔagaS mutants were examined for growth on Aga and Gam plates without any added nitrogen source (data not shown). These results show that the loss of agaS affects Aga and Gam utilization and therefore AgaS plays a role in the Aga/Gam pathway. Growth of EDL933, E. coli C, and Δ agaS mutants on Aga and Gam. Wild type EDL933, E. coli C, and ΔagaS mutants derived from them were streaked out on MOPS minimal agar plates with Aga (A) and Gam (B) with NH4Cl as added nitrogen source. The Aga plate was incubated at 37°C for 48 h and the Gam plate was incubated at 30°C for 72 to 96 h. The description of the strains in the four sectors of the plates is indicated in the diagram below (C). Relative expression levels of nagA, nagB, and agaA were examined by qRT-PCR in ΔagaS mutants grown on glycerol and GlcNAc. In glycerol grown ΔagaS mutants of EDL933 and E. coli C, nagA, nagB, and agaA were not induced. When grown on GlcNAc, nagA and nagB were induced about 10-fold and 23-fold, respectively, in EDL933 ΔagaS and 3-fold and 7-fold, respectively, in E. coli C ΔnagB. These expression levels of nagA and nagB in GlcNAc grown EDL933 ΔagaS are comparable to that in GlcNAc grown EDL933 ΔagaA (Table 1) but the levels of expression of these genes in GlcNAc grown E. coli C ∆agaS are lower than in GlcNAc grown E. coli C ΔagaA (Table 1). The agaA gene was not induced in GlcNAc grown ΔagaS mutants. Complementation experiments were carried out to confirm that the deletion of agaS caused the Aga- phenotype in EDL933 ΔagaS and the Aga- Gam- phenotype in E. coli C ΔagaS and not because this deletion was exerting a polar effect on downstream genes, namely, kbaY, agaB, agaC, agaD, and agaI (Figures 1 and 8E). Among these genes, kbaY is involved in the last step of the Aga and Gam pathway, while agaBCD, are involved in Gam uptake and agaI is not needed for the utilization of Aga and Gam as we have shown above. Thus, if the Aga- phenotype in the ΔagaS mutants is due to a polar effect on a downstream gene it would be kbaY. As expected, the EDL933/pJF118HE and E. coli C/pJF118HE grew on Aga whereas the ∆agaS mutants with pJF118HE did not grow (Figure 8A). Importantly, E. coli C and EDL933 ∆agaS mutants with either pJFagaSED or pJFagaSYED grew on Aga (Figures 8A and 8E). Complementation of the Aga- phenotype by pJFagaSED showed that deletion of agaS caused the Aga- phenotype and not because the deletion of agaS had a polar effect on kbaY expression. Although both pJFagaSED and pJFagaSYED complemented the Aga- phenotype they failed to complement the Gam- phenotype in E. coli C ∆agaS (Figures 8B and 8E). It is likely that the deletion in agaS was causing a polar effect on agaBCD. This was tested by using pJFagaBDC to complement the Gam- phenotype. E. coli C ∆agaS/pJFagaBDC did not grow on Gam plates (Figures 8B and 8E). The plasmid, pJFagaBDC, is functional because we have shown that EDL933 which is Gam- manifests a Gam+ phenotype when it harbors this plasmid (unpublished data). Since neither pJFagaSYED nor pJFagaBDC could complement the Gam- phenotype, the most likely explanation is that the deletion of agaS not only affects the Aga/Gam pathway but also exerts polarity on the expression of agaB, agaC, and agaD. If this is the case, then the plasmid, pJFagaSDC, should complement the Gam- phenotype and it does because E. coli C ∆agaS/ pJFagaSDC grew on Gam plates (Figures 8B and 8E). Identical results were obtained when complementation was done on Aga and Gam plates without any added nitrogen (data not shown). These experiments raise the question why the partial deletion of agaS in ∆agaS mutants does not exert polarity on kbaY but is polar on further downstream agaBCD genes. The most likely explanation is that the strength of the polarity is a function of distance from the mutation [20, 21]. These complementation experiments were done at 30°C because it was observed that at lower temperatures complementation of ∆agaS mutants with these plasmids was better. In addition, complementation by these plasmids was not observed when IPTG was added at a concentration as low as 10 μM (data not shown) suggesting that over-expression of the AgaS protein, unlike over-expression of AgaA and NagA, is detrimental to the cell. These experiments clearly demonstrate that the agaS gene is involved in Aga and Gam utilization. Complementation of ∆ agaS mutants of EDL933 and E. coli C on Aga and Gam plates. EDL933 and E. coli C and the ∆agaS mutants derived from them harboring the indicated plasmids were streaked out on Aga MOPS minimal agar plate with NH4Cl (A) and containing ampicillin and incubated at 30°C for 72 h. For Gam complementation, E. coli C and E. coli C ∆agaS harboring the indicated plasmids were streaked out on Gam MOPS minimal agar plate with NH4Cl (B) and containing ampicillin and incubated at 30°C for 96 h. The strains with various plasmids in the different sectors of the plates in A and B are shown below in C and and D, respectively. The panel on the right (E) describes the various plasmids used for complementation of ∆agaS mutants and summarizes the results from the plates (A and B). The complementation results of EDL933 ∆agaS/pJFagaBDC are not shown in plates A and B. Since agaI is not involved in the Aga/Gam pathway, the only step in the Aga/Gam pathway that does not have a gene assigned to it is the deamination and isomerization of Gam-6-P to tagatose-6-P. On the other hand, the agaS gene is the only gene that has not been linked to any step in the Aga/Gam pathway [1, 6]. It has been inferred that since the promoter specific for agaS is repressed by AgaR and agaS is inducible by Aga and Gam, AgaS must be involved in the catabolism of Aga and Gam . Our results with the ∆agaS mutants confirm this (Figure 7). The agaS gene is homologous to the C-terminal domain of GlcN-6-P synthase (GlmS) that has the ketose-aldose isomerase activity but does not have the N-terminal domain of GlmS that binds to glutamine . The C-terminal domain of GlmS is found in a wide range of proteins that are involved in phosphosugar isomerization and therefore this has been named as the sugar isomerase (SIS) domain . This SIS domain that is in AgaS has been shown to be present in prokaryotic, archaebacterial, and eukaryotic proteins . Interestingly, a novel archaeal GlcN-6-P-deaminase which has been demonstrated to have deaminase activity is related to the isomerase domain of GlmS and has the SIS domain . Proteins with SIS domains have been classified in the Cluster of Orthologous Group of proteins as COG222. It was proposed by Tanaka and co-workers that although AgaI has sequence homology to nagB encoded GlcNAc-6-P deaminase/isomerase and has been predicted to be the Gam-6-P deaminase/isomerase, AgaS which belongs to COG222 could be an additional Gam-6-P deaminase . Based on these reports and our findings that neither agaI nor nagB has a role in Aga and Gam utilization, we propose that agaS codes for Gam-6-P deaminase/isomerase. In light of this proposal that agaS codes for Gam-6-P deaminase/isomerase, we tested if pJFnagB would complement E. coli C ∆agaS mutant for growth on Aga and similarly if pJFagaS would complement E. coli C ∆nagB mutant for growth on GlcNAc. In both cases, no complementation was observed even with 10, 50, and 100 μM IPTG (data not shown). Therefore, these results show that agaS and nagB function only in their respective pathway. Whether agaI serves as an additional deaminase/isomerase remains uncertain because over-expression of agaI from pJFagaI in E. coli C ∆agaS was unable to complement the Aga- phenotype (data not shown). The Aga/Gam pathway has not been extensively studied as evidenced by the few publications that exist in the literature [1, 6, 9–11, 24]. In this study we show that agaI is not needed for growth on Aga and Gam and nagB does not substitute for the absence of agaI as we had originally proposed . Instead, we propose that the product of the agaS gene carries out this step. During the preparation of this manuscript, Leyn et al. published a paper that also showed that agaI is not essential for Aga utilization but agaS is essential . Also, in a three-step enzyme coupled assay they showed that AgaS has deaminase activity and in a two-step assay they detected AgaA deacetylase activity . In their experiments they observed complementation of the ∆agaS mutant with the agaSY and not with agaS alone as we have observed. This difference is most likely because they used agaS deletion mutants with a spectinomycin cassette that could cause a polar effect on kbaY. Furthermore, they carried out complementation in liquid medium whereas we did on agar plates at 30°C which could cause this difference. Additionally, we show that agaA is not essential for growth on Aga because nagA can substitute for agaA and that agaA and nagA can substitute for each other but, on the other hand, agaS and agaI cannot complement a ∆nagB mutant and neither can nagB complement a ∆agaS mutant. Interestingly, AgaA has only 10 fold lower activity with GlcNAc-6-P than with Aga-6-P whereas, AgaS has 27-fold lower activity with GlcN-6-P than with Gam-6-P  indicating that agaA could substitute for nagA but agaS is unlikely to substitute for nagB as we have shown. Therefore, our genetic data complements and supports the biochemical data on AgaA and AgaS. 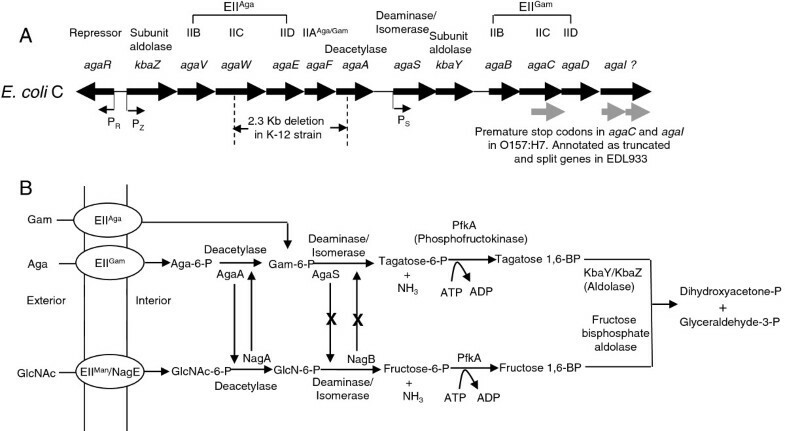 The Aga/Gam pathway as revealed from these studies is depicted in Figure 1 which shows that agaS and not agaI codes for Gam-6-P deaminase/isomerase. The interplay of AgaA and NagA but not that of AgaS and NagB between the Aga/Gam and GlcNAc pathways as revealed from this study is also indicated in Figure 1. What role, if any, agaI plays in the Aga/Gam pathway remains to be investigated. E. coli O157:H7 strain EDL933 (FDA strain # EC1275) was from our collection of strains at the Food and Drug Administration. This strain is henceforth referred to as EDL933. E. coli strain C, strain # CGSC 3121, and all strains and plasmids for gene knockout experiments by the method of Datsenko and Wanner  were obtained from the Coli Genetic Stock Center at Yale University, New Haven, CT.
To test growth on minimal medium agar plates, wild type and the knockout mutant strains were grown overnight with shaking in Luria Broth (LB) at 37°C. The cultures were then diluted 103 fold in 0.9% NaCl and streaked on MOPS modified buffer (Teknova, Hollister, CA) agar plates supplemented with 1.32 mM K2HPO4 and 0.001% yeast extract containing 20 mM of glucose, Aga, or GlcNAc. To test growth on glucose, Aga, and GlcNAc in nitrogen free medium everything was the same as described above except that MOPS modified buffer minus NH4Cl (Teknova) was used. To test growth on Gam plates with and without NH4Cl everything was the same as described above except that the concentrations of Gam and K2HPO4 were reduced by half to 10 mM and 0.0625 mM, respectively. In complementation experiments on plates, 100 μg/ml of ampicillin was added to the plates. Except where indicated, plates were incubated at 37°C for 48 h. For measurement of growth rate on Aga, wild type and knockout strains were grown overnight in MOPS liquid minimal medium with and without NH4Cl containing 20 mM Aga. The overnight cultures were diluted 100 fold into fresh medium and growth was monitored by measuring optical density at 600 nm (OD600) at indicated time intervals. The agaA, nagA, agaS, agaI, and nagB chromosomal genes in EDL933 and E. coli C were disrupted following a standard method . The agaR gene was deleted in E. coli C. The primers used for constructing knockout mutants are shown in Table 3. The knockout mutants constructed with the kanamycin cassette inserted and those with the kanamycin cassette eliminated were verified by PCR using appropriate primers flanking the target regions (Table 3). The mutants with the kanamycin cassette eliminated were further verified by DNA sequencing (Macrogen, Rockville, MD) using primers shown in Table 3. All knockout mutants used in this study were cured of their kanamycin cassettes except for the agaR knockout strains of E. coli C from which the kanamycin cassette was not removed. The whole agaI gene in E. coli C and similarly the whole agaI gene encompassing both the open reading frames (ORFs) in EDL933 were deleted creating E. coli C ΔagaI and EDL933 ΔagaI. The whole nagB gene was also deleted in both strains creating E. coli C ΔnagB and EDL933 ΔnagB. The double knockout mutants, EDL933 ∆agaI ∆nagB and E. coli C ∆agaI ∆nagB were constructed from their respective ∆agaI parents. The agaA gene coding for a 377 amino acid long Aga-6-P deacetylase in EDL933 was deleted from the 74th to the 209th codon. The identical region of agaA in E. coli C was deleted. The nagA gene coding for a 382 amino acid long GlcNAc-6-P deacetylase was deleted from 47th to the 334th codon in both E. coli C and EDL933. The double knockout mutants, EDL933 ∆agaA ∆nagA and E. coli C ∆agaA ∆nagA were constructed from their respective ∆agaA parents. The agaS gene coding for a 384 amino acid long AgaS protein in EDL933 was deleted from the 67th to the 314th codon and the identical region in the agaS gene of E. coli C was deleted. The agaR gene in E. coli C codes for a 227 amino acid long repressor protein and it was deleted from the 106th to the 183rd codon in E. coli C and E. coli C ∆nagA. a The primer names indicate the genes that are targeted for construction and verification of knockout mutants and for cloning. The number, 5, and the letter, F, preceding the name of the gene indicate forward primers and the number, 3, and letter, R, preceding the name of the gene indicates reverse primers. Restriction enzymes used for cloning a gene are stated in the primer name following the name of the gene. b The strain name indicates the primer used for that particular strain and when the same primer is used for both strains it is indicated as both. All genes cloned in this study were amplified by PCR from EDL933 or E. coli C using appropriate primers as indicated in Table 3. The PCR fragments and the plasmid, pJF118HE , were digested with indicated restriction enzymes (Table 3) and cloned following standard protocols. In this study, the following genes were cloned into pJF118HE for complementation experiments: agaA and nagA were cloned from both EDL933 and E. coli C forming pJFagaAED, pJFagaAC, pJFnagAED, and pJFnagAC (the superscripts, ED and C, indicate the strains EDL933 and E. coli C, respectively, from where the genes were cloned). The agaI and nagB genes were cloned from E. coli C resulting in pJFagaI and pJFnagB, respectively; agaS gene and the agaSY genes were cloned from EDL933 leading to pJFagaSED and pJFagaSYED, respectively; and agaBCD and agaSYBCD genes were cloned from E. coli C resulting in pJFagaBDC and pJFagaSDC, respectively. For complementation experiments, the parent vector, pJF118HE, and the recombinant plasmids were transformed into the indicated recipient strain by electroporation. Wild type and mutant strains of EDL933 and E. coli C were grown overnight with shaking at 37°C in 30ml MOPS liquid minimal medium containing 20 mM of glycerol, Aga, or GlcNAc. The overnight cultures were diluted 100-fold into fresh medium and grown with shaking. When the cultures reached an OD600 between 0.6 and 0.7, 820 μl of cultures were withdrawn and mixed with 180 μl of chilled acidic phenol which were then centrifuged for 10 min at 4°C. The supernatants were discarded and the cell pellets were frozen immediately in a dry ice bath and stored at -70°C. RNA was isolated using RNeasy Mini Kit (Qiagen, Gaithersburg, MD) following the manufacturer’s instructions including the on-column DNA digestion step using DNase I. The integrity of the RNA was checked by running 1 μl of RNA using the Agilent RNA 6000 Nano Kit in an Agilent Bioanalyzer (Agilent Technologies, Santa Clara, CA). The RNA concentrations were measured using a NanoDrop spectrophotometer. Real-time RT-PCR was conducted using the iQ5 Optical System (Bio-Rad Laboratories, Hercules, CA). Each 20 μl reaction consisted of 50 ng RNA, 10 μl of 2x SYBR Green RT-PCR reaction mix, 1 μl of the iScript reverse transcriptase for one step RT-PCR, and 10 μl of 0.5 μM primer pairs. The first step in the real-time PCR program was a10 minute incubation at 50°C, followed by a 5 minute reverse transcriptase inactivation step at 95°C. This was followed by 40 cycles of 10 seconds of denaturation at 95°C and 30 seconds of annealing and elongation at the optimal annealing temperature for each specific primer pair (Table 4), during which fluorescence was measured. Next a melt curve analysis was included by increasing the temperature from 55 to 95°C in steps of 0.5°C for 10 seconds, when fluorescence was measured to allow the verification of the presence of one gene-specific peak. The cycle threshold (Ct value) was determined by the iQ5 Optical System Software from Bio-Rad Laboratories. All samples were run in duplicate and the average relative expression of each gene was normalized with the internal control gene, glyceraldehyde 3-P dehydrogenase (gapA) and the relative fold change was calculated using 2-∆∆Ct method . a The primer names indicate the genes that are targeted for quantification of transcript. The number, 5 preceding the name of the gene indicate forward primers and the number, 3 preceding the name of the gene indicates reverse primers. b The strain name indicates the sequence used to design the primer was from that strain and when the same primer is used for both strains it is indicated as both. An erratum to this article is available at http://dx.doi.org/10.1186/1471-2180-14-127. We thank Chris Elkins, Gene LeClerc, and Galeb Abu-Ali for critically reading the manuscript and helpful discussions. We thank Carmen Tartera for providing the phenotypic microarray data. ZH carried out the construction of knockout mutants, did cloning and other experiments, participated in the writing, and critically read the manuscript. IRP planned and conducted the quantitative real time RT-PCR experiments, analyzed the real time RT-PCR data, participated in the writing, and critically read the manuscript. AM conceived of the study, planned and did experiments, and wrote the manuscript. All authors read and approved the manuscript.